Cauliflower is a highly underrated vegetable in our opinion, often dismissed for being boring. And admittedly, when we’re inundated with richly colored fall produce, the white veggie can seem a little blah. But if you’re a potato fan, this cruciferous vegetable could soon become your new best friend. You’d never know by looking at it raw, but cooked, mashed cauliflower takes on a texture that’s strikingly similar to whipped potatoes. 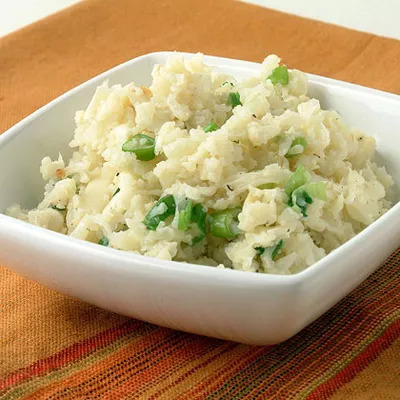 So if you’re watching your carb intake, try substituting this cauliflower and green onion mash for creamy mashed potatoes. Green onions and garlic add an extra jolt of flavor here, while low-fat milk gives the dish that smooth consistency we all know and love. Plus, one cup of cauliflower provides 77% of the daily recommended intake of vitamin C (yes, more vitamin C than an orange). If that doesn’t convince you, just think about all those potatoes you won’t have to peel. You’ll be running to the kitchen in no time.